I hope that everyone had a great and relaxing Labor Day weekend. Tony told me that he was planning on doing nothing, and it seems that he stuck to his word by not posting a review on Monday. Haha, just kidding, man. You no doubt deserved that time to yourself! The Swiss tobacco concern Villiger Stokkebye is probably best known for their machine rolled, dry cured cigarellos, such as the Export. At least that was my primary exposure to them until I got a hold of a couple of their handmade La Libertads. 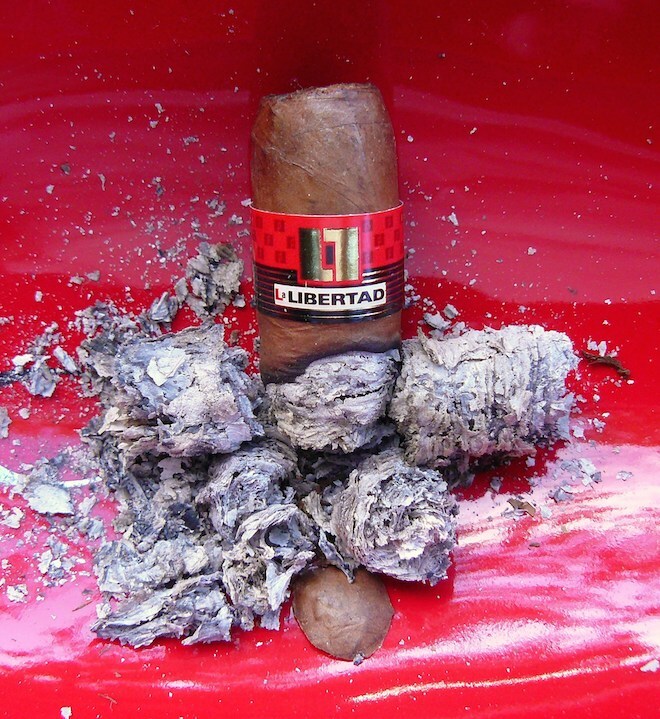 The La Libertad line has been a popular and highly regarded cigar in Europe for a while now, but was only introduced into the U.S. in 2010. The American version is a totally different blend than what has been available in Europe, though. 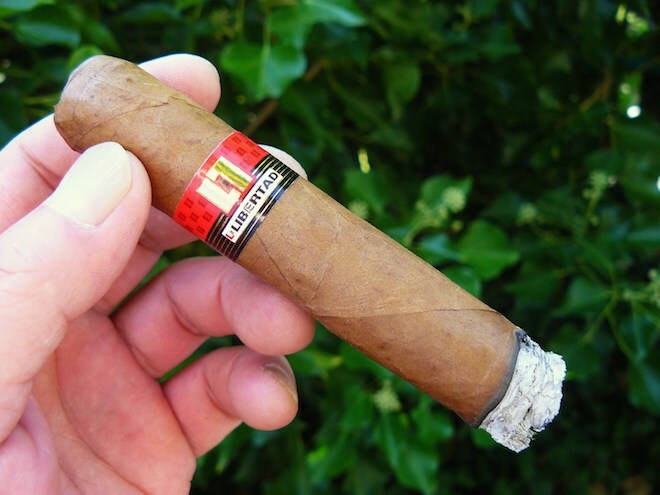 While the European La Libertad is made in Honduras from Honduran and Nicaraguan tobaccos, the U.S. blend is comprised of Dominican and Nicaraguan ligeros wrapped in a Peruvian grown Nicaraguan seed binder, and Peruvian grown Habano seed wrapper. It was the Peruvian part of the blend that really intrigued me, as some of my favorite cigars incorporate Peruvian tobacco into their blends. Cigars such as La Aurora’s Guillermo Leon, CyB from Joya de Nicaragua, Maldonado Dynasty’s The Mogul, and the recently released MBombay all utilize Peruvian grown tobaccos in their blends. The Villiger La Libertad is not the prettiest of cigars, but it’ll do. It sports a medium yellowish brown wrapper that is smooth to the touch and is well packed. There are several medium sized veins in evidence, and the wrapper culminates in a rather uneven double cap. The aroma of the wrapper displays a bit of sour and vegetal notes with a very slight barnyard. The scent off the foot is primarily tobacco with a bit of spice. The cut reveals a snug draw with tobacco, sweet spice, some lightly earthy grass, and some peppery zing. 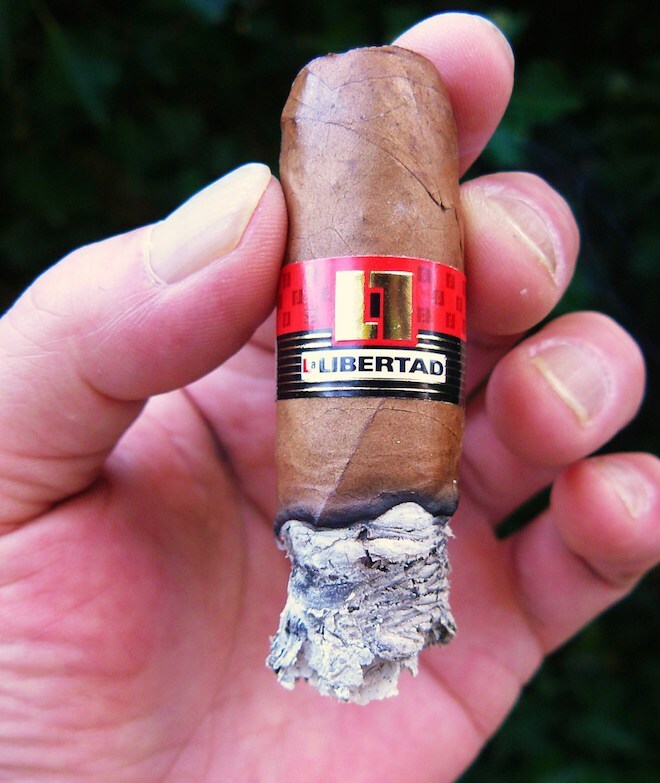 Despite the initial snug draw, La Libertad produces a good amount of smoke and opens with a mix of white and red pepper, grass, faint, citrus, and sweet spice on the tongue. The retrohale has a sharp wasabi-like sinus sting to it, along with cedar and pepper. I do not recommend a heavy retrohale with this one, at least in the first third. The burn has started out unevenly, and the brownish gray ash is fairly flaky and is a bit crumbly. I had to do a correction at 1” in, as the burn had gone off by ¾”. A little farther in, citrus, cinnamon, and a bit of toast have emerged alongside the cedar and pepper, giving a nice complexity. The ash voluntarily and unexpectedly fell off into my ashtray at a little less than 1” before I could get a photo. At the end of the first third, the pepper has faded on the palate, but continues to be a presence on the finish of the retrohale. Unfortunately, the ash continues to flake and crumble, and the burn has again gone crooked on me. The cinnamon has backed off and has been replaced by more of a nutmeg and coriander type of spice. Cedar is still at the core, but has been joined by earthiness, while the citrus has dissipated. The uneven burn has self-corrected, but ash continues to flower and flake. This is certainly not the tidiest smoke I have ever had, and if I were smoking this indoors, I would be a little annoyed with it. Just after the halfway point, some sweetness returns, along with some light leather notes and the wavy burn. The last third starts out with my second correction to the burn and the flavors have become earthier and rather smoky – not charred, more like smoldering hardwood – but a quick purge suppresses those flavors and brings back the sweetness and cedar, while the pepper makes a comeback. This continues until, with about 1-1/4” left, the cigar becomes a little too warm and the flavors begin to wash out, prompting me to put it to rest. I experienced just a little bit of a nicotine hit, but it was nothing that was out of the norm. The Villiger La Libertad carries some rather unique flavors that may not have quite come through in my review, as I admit that the link between my palate and brain is probably not sophisticated enough to describe the nuances of the experience, but anyone interested in what Peruvian tobacco can bring to the table would do well to pick up on a couple of these to see what it has to offer. The one I had smoked previously actually had a much better burn – although it was still not ideal – and exhibited a bit more creamy smoothness and even some floral spice. The burn didn’t really surprise me, considering that it is mostly comprised of ligero leaves. The price is certainly more than reasonable for the quality and uniqueness of the blend, if you can put up with the flaky ash. I will definitely grab a few more to have on hand. 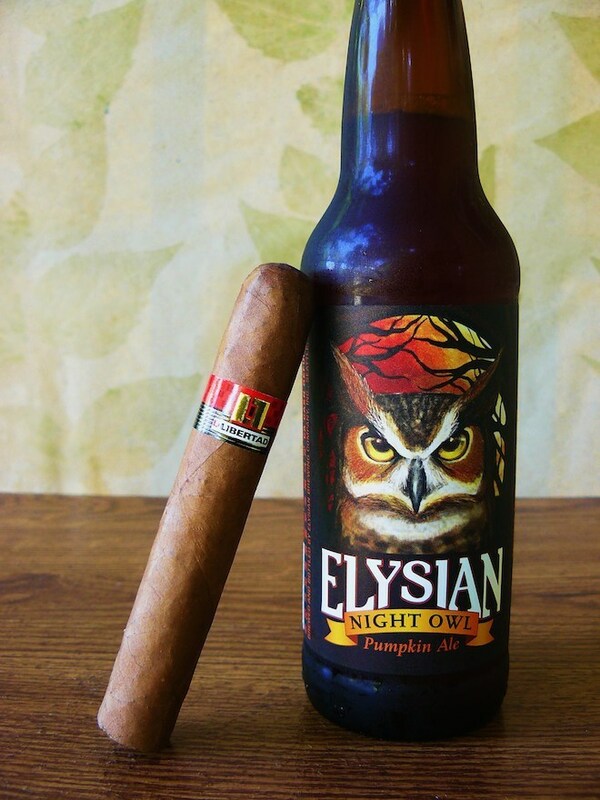 I decided to pair this cigar with the Night Owl Pumpkin Ale by Seattle brewery Elysian. Although I’m not big on fruit/vegetable flavored beers, this is not one of those dessert type, super sweet and heavy Imperial pumpkin beers. I felt that the nuanced pumpkin and pumpkin pie spices infused into this lightly sweet and slightly sour 5.9% ABV brew would match up well with the citrus and spice of the La Libertad. They did indeed, although the malty IPA I matched it with previously also went quite well with it. Again, that beer sounds tasty! Peruvian tobacco has really piqued my interest as of late. I have a few of these lying around so I’ll be sure to light one up and re-read this review. Thanks for the review man, they just keep getting better and better. Thanks Tony! I hope you enjoy that brew. Hey, Jeff. Great review. For the price and uniqueness, I need to grab some of these to try. You mentioned that in your other sample you picked up a floral spice. The only cigar I can think of off the top of my head that utilized Peruvian tobacco is the CyB by JDN. I remember a unique floral quality to that cigar as well. Funny thing is, when I read reviews of cigars that feature Peruvian tobacco, everyone agrees that it brings something special to the table, but no can seem to agree on just what that is, lol. I sometimes get a dried fruit sweetness and/or those floral notes. Just goes to show how our palates and experiences can vary, I guess. Hey Tony! Where on earth do you smoke in Seattle? I just moved here from the Bahamas, and I have no plave to smoke. Hi Nathan – Tony lives in El Paso, but welcome to Seattle, where smokers are treated like second class citizens. Fact is, the state of Washington has banned indoor smoking, and that includes tobacco shops and bars and lounges, so the only indoor places to smoke besides at home are cigar lounges on tribal land where the state has no jurisdiction, or private clubs. There is one public place in Snoqualmie (Lit Cigar Lounge) and a couple in the Tacoma area (Smokey Joe’s and Thunderbird Trading post), and Brown and Sons in Olympia has a members only lounge. The Vertigo Lounge in Seattle is a private invitation only club with a very limited membership.. In Seattle, even open areas like parks require you to be at least 25 feet away from other people and activity areas, and I think some parks don’t allow smoking at all. And of course, near businesses and offices, you must be at least 25 feet away from entrances and open windows. Cigar shops will occasionally have events where they will set up outside smoking areas, but they don’t happen very often. I myself am pretty much a stay at home smoker.